Two of Congress’s most radical members believe George W. Bush’s America was the equal of apartheid South Africa. Last week, Vermont Senator Patrick Leahy proposed that Congress establish a “truth commission” to investigate alleged Bush misdeeds. In the House, Judiciary committee chairman John Conyers seconded Leahy’s request. The concept of the “truth commission” originated in post-apartheid South Africa, when the Mandela government launched an investigation into crimes against humanity. Punishments were waived on the grounds that the nation needed to know the truth about the white minority regime’s suppression of black Africans. Presumably, Leahy assumes President Bush engaged in equally egregious behavior during the War on Terror. Leahy, like his Michigan colleague Carl Levin, hopes to distort any circumstantial evidence he uncovers about how Bush-44 successfully kept this nation free from a second terrorist attack for seven years into proof of the greatest violation of civil rights since Lincoln suspended habeas corpus. If the investigation exposes the ongoing, covert measures Bush has taken to keep America safe, Leahy will only smile as they are revealed. He has a long history of exposing the most vital secrets of our nation. At least one operative was murdered after Leahy publicly leaked a 1985 intercept that had enabled the capture of the Achille Lauro terrorists. After Leahy leaked a 1986 covert operation to topple Libyan dictator Moammar Gaddhafi, it was necessarily canceled. But for that, in other words, 270 victims of Libya’s Pan Am 103 bombing over Lockerbie Scotland might still be alive. Finally in January 1987, Leahy was forced to resign as vice-chair of the Senate’s Select Committee on Intelligence after leaking classified information on the Iran-Contra affair. Not surprisingly, after 9/11, the FBI investigated national security leaks from Congress, specifically House and Senate Select Intelligence committee leaks. In the 14 years after resigning from the intelligence committee in disgrace, the Vermont Senator also thwarted key speech and public education. In July 1999, then Defense Secretary William Cohen in a Washington Post op-ed predicted a major terrorist attack on U.S. soil. He and Secretary of State Madeleine Albright were so convinced Osama bin Laden would hit the U.S. that they canceled a planned visit to Albania that month. Yet in 2000, for fear of an unspecified threat against “civil liberties,” Leahy successfully opposed publication of a 2000 National Commission on Terrorism report in intelligence legislation—another measure that could have saved lives. Were he interested in investigations that may have some political impact, he could turn his attention to potential conflicts of interest in the Obama administration. Although Obama signed an executive order barring lobbyists from serving in his administration, he also signed 17 lobbyist waivers including Attorney General Eric Holder (until 2004, a registered lobbyist for clients like bankrupt Global Crossing), White House intergovernmental affairs director Cecilia Munoz (through 2008, an anti-immigration enforcement advocate for National Council of La Raza) and Deputy Defense secretary nominee William Lynn (until 2008, a Raytheon defense contractor executive and registered lobbyist). 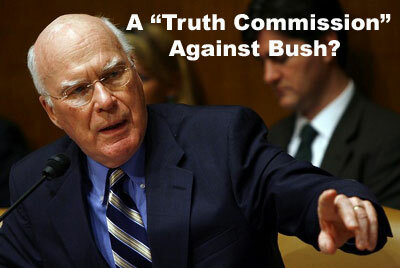 Leahy’s blatant partisan witch-hunt is the most recent sign that Bush Derangement Syndrome remains alive and well. Whatever the left’s talk of “hope and change,” of abandoning the “politics of fear,” its bomb-throwers simply wish to continue fighting yesterday’s battles, because their hatred will not allow them to, err, Move On. Is a ‘Little Bit of Sharia’ Okay? Why does Denmark prosecute truth tellers? This entry was posted in Articles, Business and Finance. Bookmark the permalink. What did Cheney call him? I don’t believe if would be possible to find two more delusional men in United States. Leahy’s behavior on the Judiciary Committee insisting that enemy combatants have habeas corpus is damaging to our nation. Conyers seems to be a card carrying member of the umma. Then, there is Monica.